1) Just use an old VCR! 2) Just use an old computer! End of thread… End of post… That is where the story ends and it leaves a lot to be desired. I have problems with both of these solutions. This can be negated if you have a cable box that already does that. But there are still people out there without cable boxes. Or don’t want a cable box in every room or on every device; I’m sure the cable companies want you to. I can’t seem to justify the extra $30 + fees for the box to move away from basic cable. Renting a cable box seems like a dirty tactic to me; in the long run they have to make a killing. I have NetFlix so if I want to watch a movie I can just get it off of there. Also, there is NetFlix streaming which is awesome. I do not want to give the cable companies more money – it’s already highway robbery. The problem with this is that projectors do not have a TV tuner. It doesn’t know what to do with the coax connection. Projectors cannot tune (most of them that are out there anyway). But I believe there is a happy medium… a product by Ambery.com -> Super Video to WXGA Converter. 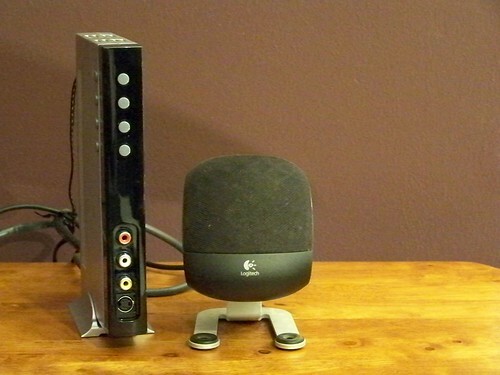 This device works much like a cable box expect that you can buy it and use it how you like. 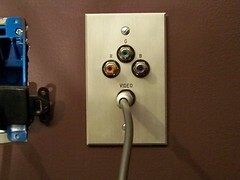 It takes a coax connection (Clear QAM), it won’t decrypt any of the pay channels like a real cable box, and converts it to composite, VGA, or S-Video. Composite will most likely be your best choice for a projector. I believe they also have one with component connections. If you are looking for HDMI I’m not sure what will be needed – I’m guessing an upconverter of some sort. Clear QAM is important. If the device is not Clear QAM then it will not be able to tune to the cable frequencies. If you have been looking at the Analog-to-Digital most of the ones that I have found do not have clear QAM meaning they will not work with cable; you will need an antenna to retrieve the signals. 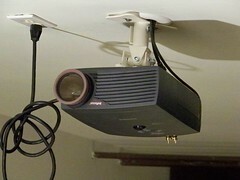 My coax cable runs into the Super Video to WXGA Converter and from there the S-Video runs into my projector. I also have component cables for in the future. There is also some HDMI lurking behind the panel, but I don’t think it will be needed for awhile. This face plate comes from, LibertyCable, an interesting cable that does orders by the phone, but none-the-less has a really great product; not too many other choices out there. So composite into the wall that runs up to the projector that is mounted on the ceiling. It’s really that simple. I hope that can add some clarity to a problem that can be over/under thought. This is my geeky trade-off do-the-job kind of way of doing things.